Located in the historic centre of Rome, is what must be the most famous and spectacular fountain in the city, and hence, one of the cities most popular tourist attractions. 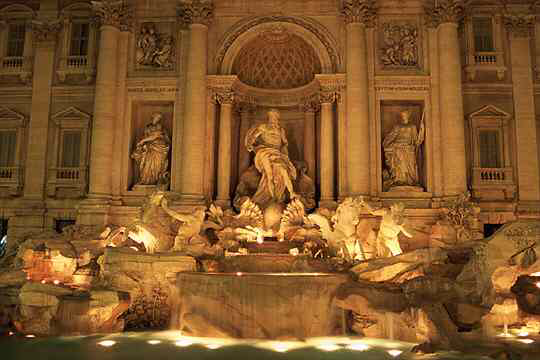 The Trevi Fountain derives its name from its position at the intersection of three roads (tre vie). The Trevi fountain stands at the end of the Aqua Virgo, which is one of the ancient aqueducts that supplied fresh water to Rome since 19 B.C. It brings water all the way from the Salone Springs, which is situated over 20 kilometres away. There has been a source of water at this site for over a thousand years, although it was not until 1485 that Pope Nicholas V commissioned Gianlorenzo Bernini to create the fountain, but the project had to be abandoned when Pope Urban VIII died in 1644. Then in 1732, Niccolò Salvi was employed by Pope Clement XII to continue with the work, with the result being the Baroque masterpiece that completely dominates the little square today. The sea god Neptune in a chariot in the form of a shell dominates the centre of the fountain. The chariot is pulled by two sea horses, with each sea horse being guided by a Triton. 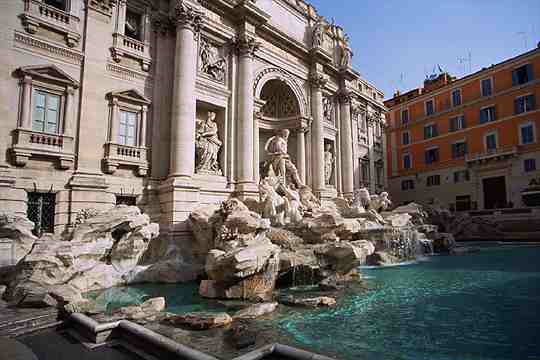 According to legend, anyone who throws a coin into the water is guaranteed to return to the Eternal City of Rome. The coin should be tossed over your shoulder while you are standing with your back to the fountain.